Keochinda Keosuliya, 21 triumphed at the First Miss Apone Lao Beauty pageant, held on Saturday, causing quite a stir among those who had been following the competition leading up to the event. Her three-title victory came as a huge surprise, as she won not only the Miss Apone Lao crown, but also the Miss Friendship and Miss Beautiful titles. “I did not think that I would win the contest as there were so many beautiful girls on the stage with me” she told the VientianeTimes by telephone, yesterday. “However, I did my best, and I will continue to do my best.” Ms. Keochinda, from Champassak province, received a crown worth 10 million kip, cash worth 15 million kip, jerwellery worth 7 million kip, a sash and other presents, after she was named the winner. She racked up a further 2 million kip for taking the title of Miss Beautiful, and yet another 3 million kip for winning the Miss Friendship title. 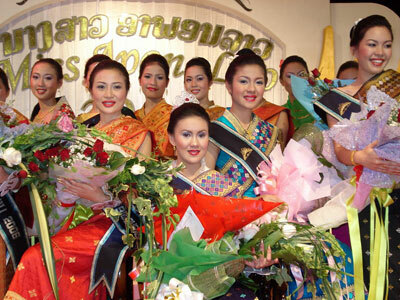 In choosing the winner, the judging panel considered the attitude of the contestants, looking to see if they were true Lao women, how well they answered the questions put to them and how they had behaved in the run-up to the contest. “We were unanimous in choosing Ms keochinda,” said one of the judges and Vice President of the Lao journalists’ Association, Mr Somsanouk Mixay. “She was able to answer our question well… and I believe she will perform well in her role of informing people both at home and abroad about Lao culture and traditions,” He said. Miss Apone Lao will be considered a representative of Laos, and will act as an ambassador for Lao culture and tradition, both locally and internationally. Further details, including a video of the event are available here. But, unfortunately, no clear answer on what a “true Lao woman” really is.